I have a confession to make, I HATE Fall!!! I know, it's practically heresy and will probably get me kicked out of New England but I really don't get it. You can take your boots, pumpkin spice lattes, and "crisp" autumn days... I like it hot and humid, where layering means throwing a cover-up over your bikini, flip-flops are the only shoes you wear, and refreshment comes from a bucket of iced tea. As a result I really don't have any fall decorations. October it's all Ghastly and come December it looks like Rudolph puked up Christmas but November, I got nothin'. 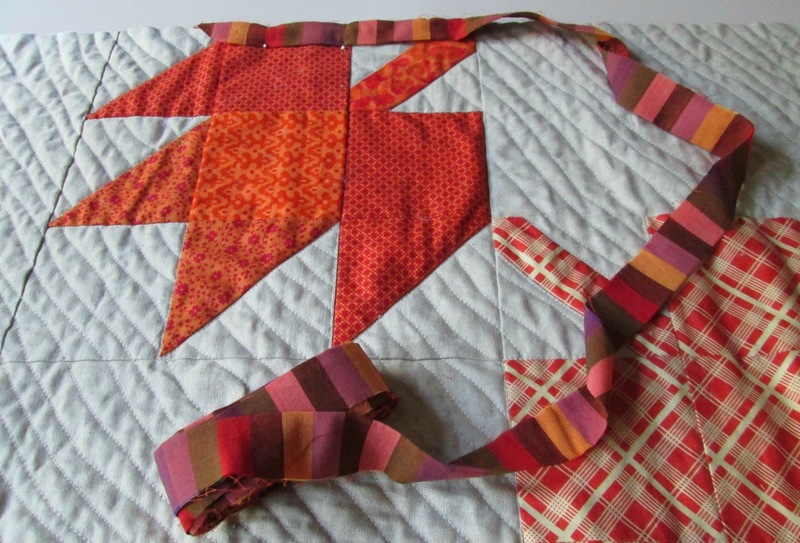 So when the utterly awesome Natalie said I should make a Modern Maples quilt I was like, "No Thanks!" But then I saw her quilt and one by the awesome Story of Kat, and the amazing Modern Maples Flickr group and I decided maybe I could do this. The fabulous Mrs. McPorkchop started this craze when her pattern was published as part of Pretty in Patchwork: Holidays. This block is really just a 9 patch made up of squares and HSTs so it goes together quickly and is easy to resize. I couldn't believe I was able to do this all from stash! I've really been trying to use some of my most precious fabrics so you'll see some long hoarded Mendocino in here along with some of my favorite Denyse Schmidt and Anna Maria Horner prints. I wanted to add some texture so I used Natural Essex linen for the background. For the quilting I used fairly dense wavy organic lines which I hope look like the wind blowing. I used the heavier 28 wt. 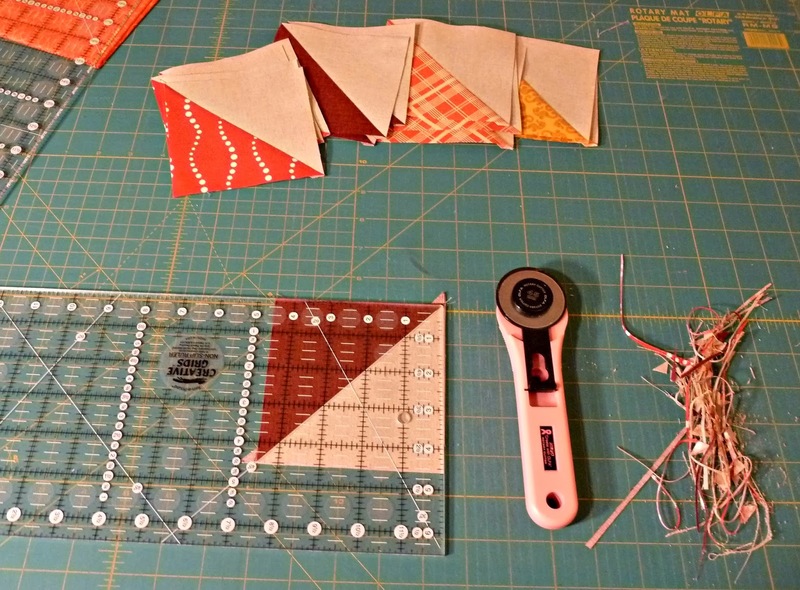 Aurifil to give the quilting extra definition. I couldn't believe my luck when I found these sublime stripes in my stash, absolutely perfect for the binding! Finished quilt is 28 1/2" x 85"
Pattern: Based on Modern Maples by the fabulous Mrs. McPorkchop for the book Pretty in Patchwork: Holidays and available here. Fabrics: Natural Essex Linen, Stash including Mednocino by Heather Ross, Chicopee and Flea Market Fancy by Denyse Schmidt, Innocent Crush by Anna Maria Horner, Simply Color by V+Co. and Lucky Penny by Alison Glass. Thread: Light Beige Aurifil (2310) 28 wt top thread, 50 wt bobbin. I'm glad I'm not the only one here in New England that HATES fall. The colors are my least favorite and the smell of pumpkin makes me nauseous. Give me summer again! The table runner looks awesome though. Maybe some day I'll embrace fall like you and make something fall-like too. Your strong feelings about fall make me laugh. Life would be boring if we all liked the same things. hahah lovely runner! I'm with you as far as favorite weather being hot, humid, and spent in as little clothing as possible, next to a pool or large body of water (if possible), with a nice large bucket of cool drink by your side (and maybe some knitting, hand stitching, or a good book). Oh, and of course a babysitter. But I'm okay with fall, mostly. I don't do the house decorations yet, mostly because I hate taking them all down after the season, but this is a lovely table runner and perhaps I'll try one for next year. I love the runner -- and I love fall -- here in Minnesota fall is perfect weather -- no BUGS --- seriously -- anything beats -40 and a windchill !!!! I'm sorry you don't love Fall! It is kind of the quintessential New England season. I hate heat and humidity. I love the weather in early Fall. Truly, I'm a four seasons sort of girl. I'd never be able to live in the South. Your runner is stunning, though. I'm glad you embraced the colors for just a bit! OK, so we need to talk! You most definitely are in the minority for your view on fall in New England...and I give you A LOT of credit for being honest!! I do fall decorations that work all the way through Thanksgiving. All that aside, your table runner is beautiful and looks great on your table! 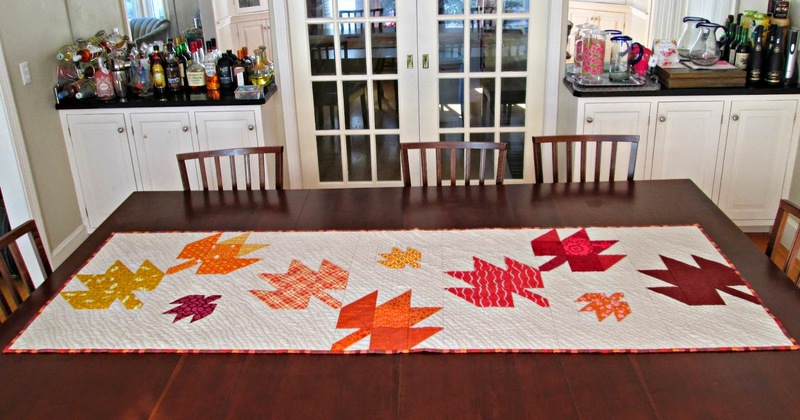 You did a great job on that Falling maples table runner for not liking fall ;). Lovely table runner! 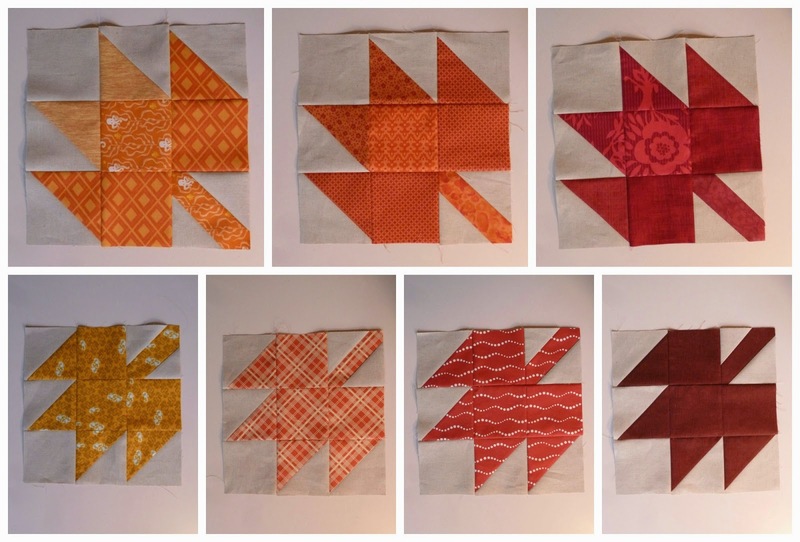 Beautiful blocks and quilting! For hating fall you sure know how to make a lovely fall runner! I love this!